Have you ever found yourself sitting in a hospital, alongside a loved one, feeling confused, lost and overwhelmed? Hospitals are inherently frightening places, especially today as they are doing more with less staff and providing shorter hospital stays. That's the bad news but the good news is that there is now a guide that not only arms you with critical information but also helps you to become the advocate your loved one needs in order to ensure they receive quality medical care. Chapter 1: The Special Language of Medicine This chapter acknowledges the difference in "languages" spoken between non-medical people and medical professionals. It helps to close those gaps by providing you with much of the basic medical terminology needed to successfully negotiate the hospital environment. Chapter 2: Surviving the Crisis This chapter normalizes the very emotional and unsettling experience of having someone you love hospitalized. It explores the various emotional stages encountered and provides suggestions for good self-care. This chapter provides an overview as well as definitions for many of the medical tests a patient may experience. It gives the reader standard ranges for many blood tests, providing the reader with an understanding as to normal ranges. Chapter 4: Hospital Staff: Who Are They? What is their Role? As the title suggests, this chapter identifies the many and varied "ologists" a patient and family may meet in the hospital setting. The authors explain who they are and the role they play in the care of the patient. Chapter 5: Working Together - The Patient Care Partnership The Patient Care Partnership - Understanding Expectations, Rights and Responsibilities is a comprehensive document developed by the American Hospital Association. It is reprinted in this book with their permission. This document greatly expands the existing Patient Bill Of Rights. Chapter 6: Advance Directives This may be one of the most important chapters in the book. This chapter explores the necessity and usefulness of having such documents as a Health Care Proxy, Living Will, DNR and DNI forms as well as a Power of Attorney. The authors also explore the emotional challenge of completing these documents as well as how to best approach family members about it. Chapter 7: The ICU Experience The Intensive Care Unit can be one of the most frightening places to be, both for the family and the patient. This chapter attempts to de-mystify all those machines, alarms, numbers and lines. By understanding what they all are and what the numbers mean, family members may be less frightened and less overwhelmed. 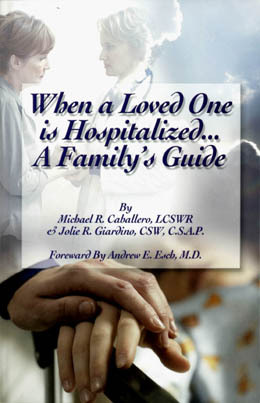 Chapter 8: Going Home This chapter provides practical and valuable suggestions to best prepare the patient and family for the patient's discharge and return home. While the book is a very practical, technical guide, it is written with humor and humanity, which makes it very readable and user friendly.